Hollow SUP’s, surfboards and prone paddleboards that are built from strips of wood over a light framework all have one thing in common; a semi monocoque structure. What is a semi monocoque structure? Think of an aircraft fuselage or wing on most aircraft and you are looking at a semi monocoque structure. Other terms used to describe this structure would be “torsion box” or “stressed skin”. The loads applied to the structure determine the size and spacing of the internal framework. 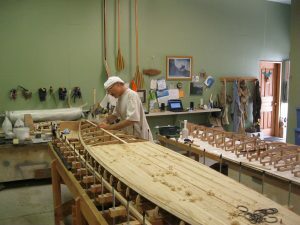 Generally speaking, in hollow wood SUP and surfboards the loads are such that a fairly light internal frame can be used. High quality marine plywood is a good example of an engineered composite material with a very high weight to strength ratio and is the typical material used for the internal framework on most hollow paddle and surf craft. 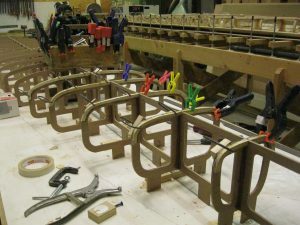 The skin to frame attachment is critical to maintaining the integrity of the structure; as long as the skin stays attached the structure will maintain its form which is why most hollow boards have added gluing surface attached to the perimeter of the plywood frames. The performance of semi monocoque structures can be enhanced in a number of ways. Point loading such as that produced by a paddlers feet or the impact from going down hard on your knee(s) can be resisted by decreasing the span between the frames or by increasing the strength of the skin or both. Heavier paddlers and riders or those wanting to maximize the overall strength of the board often fiberglass both sides of the deck panel and install the panel in one piece. When single panel installations are not practical the deck panel point load resistance can also be increased by fiberglassing between the frames on the underside of the completed deck panel.